M-Link enables flexible Forms Discovery and Publishing (FDP) using protocol described in XEP-0346. FDP provides a mechanism to allow M-Link to store a list of Topics and associated form templates that can be retrieved and completed by an FDP-aware client. Once the completed form is submitted back to the Server, interested parties who have subscribed to the Topic will be immediately notified that a new instance of the form has been completed. Forms are widely used in military operations, where there is a need to handle forms (such as Medical Evacuation or "MEDEVAC" forms) quickly and share completed forms with a large number of parties who may need to take action, such as helicopter services, emergency vehicles and medical facilities. The FDP capability is shipped as part of the M-Link User Server and the M-Link Constrained Network Server. 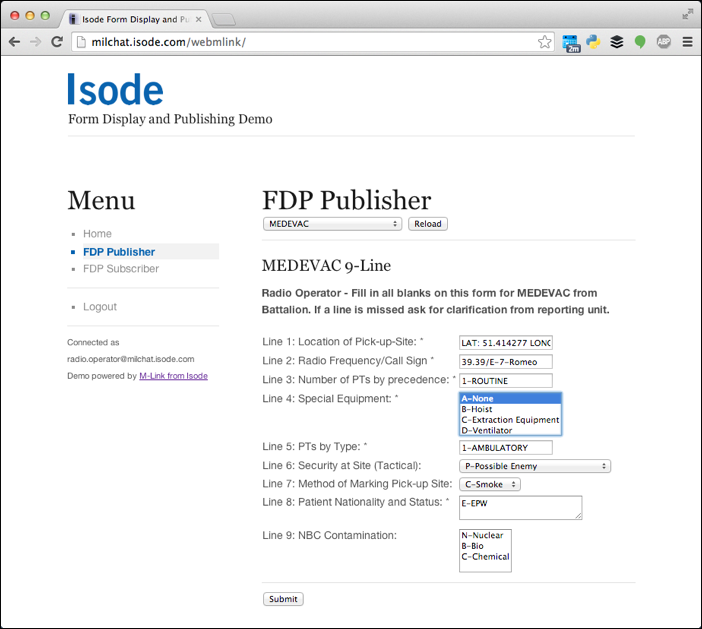 A Topic (such as MEDEVAC) and associated form template is created using M-Link Console. A FDP Client discovers the Topic and, using the provided form template, submits a completed form back to the Server. The Server notifies any interested parties (Subscribers to the Topic) that a new completed form has been submitted, allowing them to request a copy of the completed form. Subscriptions to Topics and publishing of completed forms is achieved using XMPP PubSub. The FDP service as well as the FDP Topics and form templates can be configured using the M-Link Console management GUI. Obtain a list of available Topics (and associated form templates). Select a Topic, fill in the form and publish it. Subscribe to one or more topics, review published forms and be alerted to new forms. Other FDP capable clients, such a NATO's JChat client, may also be used for both publish and subscribe purposes. Background to this requirement and a more detailed description of the M-Link FDP support are provided in the whitepaper [Military Forms using XMPP].